Penny Lane: You are too sweet for rock and roll. If the old phrase "you are only as good as your last picture" holds true, then Cameron Crowe should be nothing short of golden. With only three films under his belt before directing last year's Almost Famous, Crowe has proven to be the most consistently talented director around. One needs to look no further for proof of Crowe's talent than this absolutely terrific film—and it isn't even his best work. Almost Famous is essentially Cameron Crowe's love letter to music. While taking several liberties, the film is a semi-autobiographical look back at Crowe's youth, when he was a writer for both Creem and Rolling Stone magazines. Here, 15-year-old William Miller (Fugit) is a high school senior who gets the chance of a lifetime: the opportunity to travel and write a piece on Stillwater, an up and coming band. Soon, though, William gets thrust into the lifestyle by the group's guitarist, Russell Hammond (Crudup). He also begins to fall in love with one of Stillwater's "band aids", Penny Lane (Hudson), who also has a close relationship with Russell. At the same time, William's mother (McDormand), attempts to keep tabs on her son by calling the hotels he is staying at and leaving a simple message: "Don't take drugs!!!". Last fall I overheard a co-worker call Almost Famous, "...some movie about a kid who writes for Rolling Stone, and he goes on the road with a band." How I kept from assaulting the person still amazes me to this day. At the core of the screenplay is William's coming of age during his time with the band; experiencing sexuality, as well as coming to terms with being outside of his mother's protective watch are perhaps two of the most important things that William learns in his time on tour. While those problems are common to most everyone growing up, William indeed has them thrust at him at a very strange time in his life. Crowe understands that and shows beautifully how quickly events that happen when you least expect them can mature you, and allow you to be more in control of your life. Those expecting a "tell all" look behind-the-scenes at the world of 1970s rock will be upset that Crowe shows Stillwater as just an average group of guys. Although there are moments that fall victim to rock and roll movie clichés, like when a famous producer is brought in to change the direction of the band, forcing out the manager who has been there since the beginning. There is the inevitable infighting amongst the band members as a T-shirt is designed featuring Russell too prominently, while the other members are slightly out of focus. Almost Famous marks the first trip behind the camera for Cameron Crowe since the hugely successful Jerry Maguire nearly four years ago. Those expecting instant catchphrases like, "Show me the money!" or "You had me at 'Hello'" will be disappointed, but Crowe does supply a more than ample amount of memorable dialogue. Perhaps the most amazing aspect of Almost Famous is the incredible detail that the filmmakers took to recreate the 1970s. Watching the picture, it almost feels as though Stillwater is real and you are watching a documentary. Credit should be given to both cinematographer John Toll, who does his usual, excellent work, as well as costume designer Betsy Heimann. As is the case in each of Crowe's films, the cast of Almost Famous is note perfect. In perhaps the best performance of the film Kate Hudson shines as the beautiful Penny Lane. Her work simply elevates each scene that she is in, as she her self-assurance goes quickly from one end of the spectrum to the other. I keep thinking about her scene with Fugit towards the end of the film—it is perhaps my single favorite moment in any 2000 film—and if you watch it and don't feel your heart strain then you simply aren't human. There is a moment when she speaks no dialogue, but her look at the camera is absolutely amazing. Fugit, in his feature debut, is also perfect as William; not only does he have good chemistry with the other actors, but, more importantly, he has the talent to keep us interested in the story. Frances McDormand and Billy Crudup are each outstanding in their roles, and in perhaps the two best supporting performances of the film, Phillip Seymour Hoffman and Jason Lee each steal every scene they are in. Hoffman in particular has a great speech about the benefits of being uncool. Image Transfer Review: Presented in a beautiful 1.85:1 anamorphic widescreen transfer, Almost Famous is among the best looking DVDs I have seen in recent months. Sharpness and detail are consistently excellent and there are no print flaws evident throughout. Pixelation is never a problem and the one area I thought would be a problem, the many darkly-lit performance scenes, come off looking well, with no grain at all. Colors are vibrant as is evident in chapter 13, as the bus drives across the countryside. This is yet another reference quality transfer from the folks at Dreamworks. Audio Transfer Review: As with most recent Dreamworks releases, Almost Famous features both Dolby Digital 5.1 and DTS surround mixes. Each mix is essentially dialogue-driven with a few moments of surround activity in the concert scenes. Bass is tight and well defined; the mix creates a nice concert like atmosphere. The heavy use of music is clear and always pleasant to here; in fact, the scene in which Kate Hudson dances to The Wind by Cat Stevens sounded better on this DVD than my CD version of the song. The DTS mix does get the edge in terms of quality, as the sound is cleaner and more atmospheric. A Dolby 2.0 channel mix is also available. Extras Review: Originally announced as a two-disc special edition with Crowe's longer cut of the film featured, Almost Famous was soon downgraded to a movie-only DVD. What is here in terms of extra features is worth a look, though. The Making of Almost Famous is a fairly promotional documentary that's also praise-heavy for Crowe, but hey, the guy deserves it. Members of the cast talk about the story and Crowe talks about the events of his life that have carried over to the movie. A selection of Rolling Stone articles features seven written by Crowe. The artists featured are: The Allman Brothers, Led Zepplin, Neil Young, Peter Frampton, Fleetwood Mac, Van Morrison and Joni Mitchell. Cast and filmmaker bios, as well as the theatrical trailer and a Fever Dog music video by Stillwater round out the extra features. How anyone can not absolutely adore this movie is beyond me. Music, more than anything else, can guide your life if you let it. Almost Famous understands that, and that love for music that director Cameron Crowe has is so evident in this picture and makes it great. While there is supposedly a longer cut of the film in existence and rumors say it will be out on DVD at a later date, why would you not want this film in your collection in any version? 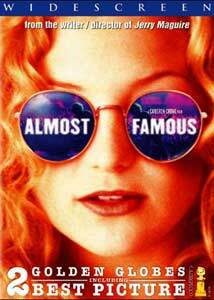 Almost Famous is my second favorite film of 2000 (for those curious, Traffic is number one), and as it stands, it is my favorite DVD of 2001. Highly Recommended.